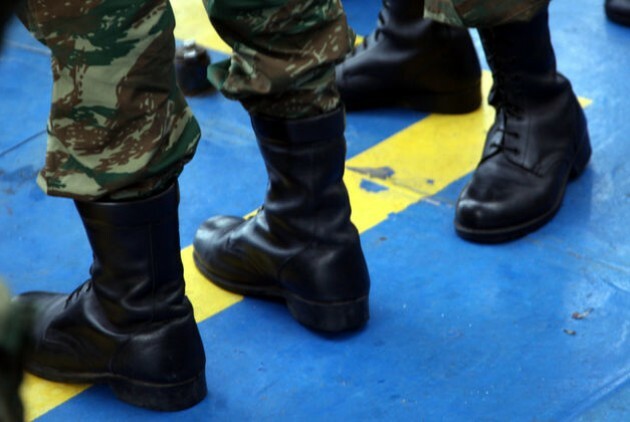 Greek Conscripts: "WE WON'T TAKE PART IN FIGHTING MIGRANTS"
Before they became headline news many of us saw and experienced these shameful images on the River Evros, and on the islands, where we were sent to do our compulsory Military Service of the Absurd as both slave workers and cannon fodder. These scenes have shocked us and dominate our discussions. But we don’t want this to become the “new normal”. While not having grown used to and not having accepted the Memoranda and all the policies against the people, imperialist interventions and their dirty wars, we will not accept and not get used to the refugees' plight. It is also the plight of our own people, of our own world, the working class world regardless of nationality-religion-gender! The so-called "increased flow of migrants" is in reality the flight from war and displacement. It is not a natural phenomenon. Someone is responsible for it. It's their capitalist crisis. To overcome this, they abolish our rights, leaving us starving, in poverty and unemployment, making migration a necessity. It's the USA, NATO, the EU, China and Russia. They impose their financial interests using terror and death, maintaining and reviving new passions and hostilities, feeding on religious fundamentalism. It’s also the regional imperialist powers (Turkey, Israel, Greece, Arab governments) that sharpen rivalries in the region. The Greek state and the army are part of the problem and not its solution. The SYRIZA-ANEL government continues the War on Terror, participates in imperialistic plans, targets "asymmetric threats" (immigrants, social movements), playing on the false distinction of “good” refugees from war – and “bad” economic migrants. The Armed Forces call on us, the conscripted soldiers alongside professionals and officers, to make war on the "enemy within", as in the recent Parmenionas 2015 (3) exercise! In this cycle of death-exploitation-oppression, the "enemies" of Greece and Turkey jointly patrol the Aegean, cooperating in harmony! Furthermore, the EU battlefront starts from Gibraltar ending in the Aegean, with Frontex (4) taking a decisive role. A Greek submarine participates in the European fleet that operates in the Libyan territorial waters. We, the 16th Division in Evros, are on guard against migrants coming from Andrianopolis. We're ordered to take part in Crowd Suppression Drills, as in Kos after the dramatic events in Kalymnos when the governor requested military aid to use weapons against hungry-thirsty-imprisoned immigrants. We guard the murderous fence which is the real reason of all the drownings in the Aegean. To block in any way we can Frontex, NATO, the European army, the actions of the Armed Forces as this massacre goes on. We don't participate in arrest patrols. We refuse to convert the Greek army into a repressive apparatus whether that involves migrants or social movements. We will not accept papering over the cracks in the social structure with "volunteer labour". For us the “asymmetric threat” is the war being waged against us by the governments and the interests they support. What the refugees are now going through, constant persecution by totalitarian mechanisms of every kind, in the struggle for dignity and survival their sad present is for many of us the current and future nightmare that we should not have to experience. It is the Parliamentary totalitarian state in collaboration with the NAZI Golden Dawn. Today there isn't a better form of solidarity in practice which gives the greatest service to ourselves than attacking the problem at its roots. 547 Rethymnon Airborne Battalion, Sparta KEEM, 616 Infantry Battalion, Avlona KETTH, 535 MK/TP 31st Brigade, Patra KETCH, Mesologgi KEN 2/39 SP, 526 MK/TP, 124 PVE Tripolis, Cpt. Paraschos 29th Infantry Brigade, ASDYS, 221 EMA Plati Evros, 401 Military Hospital atallion Administration, Thiva KEPV, 16 TYP, Nafplio KEMCH, Evros Chatzipenti Camp, 211 MK/TO 95 LATETH, Araxos 116 PM, 3rd Cooking Education Battalion-Gythio Supply Dept., 647 MK/TP Litochoro, 50 PEA/AP, SDB Karaiskakis B Company Management, 219 KICHNE Didymoteicho, 173 MEAP Orestiada, 516 MK/TP, 424 SN Thessaloniki, Evros Vogiatzis Feres Camp, 642 TP, Bouga Camp, 32 MPP PN, KEN Kalamata, 643 TE Chios, 123 PTE, 618 M/K TO Plati, 296 M/K TE, KAAY Agios Andreas, 93 TYETH Lesvos, 503 TP, 95 TYETH, 22 EMA Petrohori, 25 EMA Petrochori, B EANETH, 107 A/K MMP PEP Didymoticho, 305 SPTCH, 3rd EAN Alexandroupolis, 107 Chatzipenti Koufovouno Camp, Evros 523 Mavrodentri Kozani. Translated from the Italian source atenecalling.org by the Communist Workers Organisation October 26 2015. Background footnote information largely provided by the Internationalist Comrades of Greece. (2) The first of these refugee “hot spot” registration centres was established on Lesbos only a few days ago. Refugees are made to queue here, probably for days, to be finger printed like criminals before they get a preliminary asylum hearing which determines if they can be registered for entry into the EU. (3) The Parmenion Army training exercise take place every year but this year’s was notorious for being on the fence which the EU pays Greece to maintain and defend on the border with Turkey along the River Evros (see opening of the soldiers’ document). Tsipras, complete with Airforce jacket, attended this year’s exercise in which he declared that “Greece’s borders were safe”. Several refugees (7 are documented by Human Rights Watch) have been gunned down there in recent days by border police. (4) Frontex is the European Agency for the Management of Operational Co-operation at the External Borders of the Member States of the European Union. In short it is the border police of the European Union. An interesting and curious turn of phrase "even our dreams". The bourgeoisie are now so destructive to give a list of their misdeeds would take too long. So let's just say "they destroy even our dreams"
And as it must be extremely likely that our dreams contain the developing idea of an alternative and thus communist society - because that's all that's left as a viable possibility - to have this "dream" disturbed is the final atrocity. So what do we conclude? Our "common class interests" require the cessation of bourgeois rule and its replacement with our dictatorship as a prelude to communism. I think you'll find you can get them via the blog posted in the previous message.